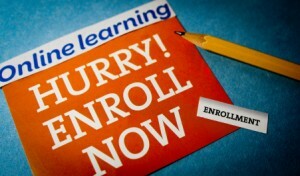 Home / Blog / WriteAtHome Fall Enrollment Begins! As my regular readers know, I rarely use blog space to directly promote WriteAtHome, but every so often I feel the need to make important announcements. Today’s one of those days. We’re trying something new this year in an effort to encourage customers to sign up early. It helps tremendously to know as early as possible what our student load will look like in the fall. But it’s typical for the majority of our families to sign up in August each year, making that a busy month for us. So, we’ve restructured our tuition prices to give WriteAtHome families incentive to enroll their students early. From February 1 through the end of March, we are offering our 2013-2014 annual courses at an $80 discount from the full price we’ll be charging late in the summer. Full price for annual courses will be $449, but folks who sign up in February or March will pay just $369. SAVE $80 BY ENROLLING EARLY! We know it’s early to start thinking about next school year, but we are hoping to reward folks who know in advance they want to use WriteAtHome.com to help their students get to the next level in their writing. Remember, we don’t penalize people for changing their minds. If you sign up a student for a WriteAtHome course and then decide to go another route, we will refund your full tuition. And of course, our courses are all backed by our 100% money back satisfaction guarantee. You have 100 days to decide if an annual course meets your expectations. If it doesn’t, we’ll return your full tuition. It’s always been our policy. If you are not interested in a full-year course, our 8-week workshops are discounted also. Through the end of May, all workshops other than the SAT Prep Workshop are only $139. If you sign up for more than one workshop at a time, the price drops to $129 each. If you are thinking about enrolling in a WriteAtHome course for next school year, don’t delay! Visit our website right now and take writing off the Subject Areas to Worry About list. Comments or questions? Leave them below and I’ll answer right away!